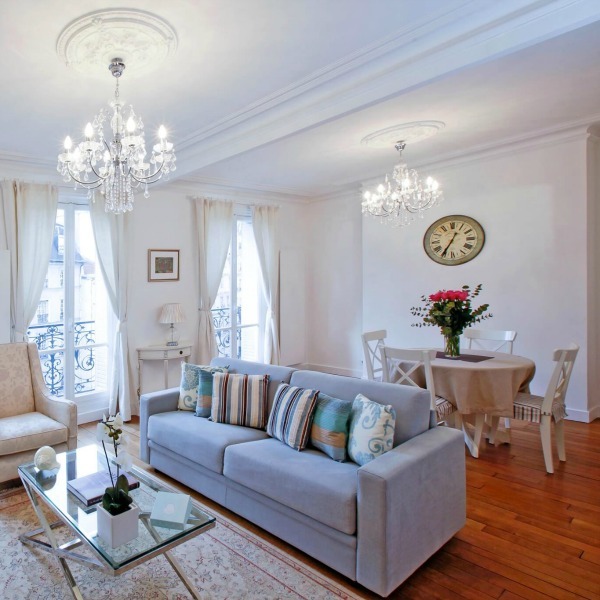 Apartments located in Paris are easy on the eyes, yet anything but easy on the budget. 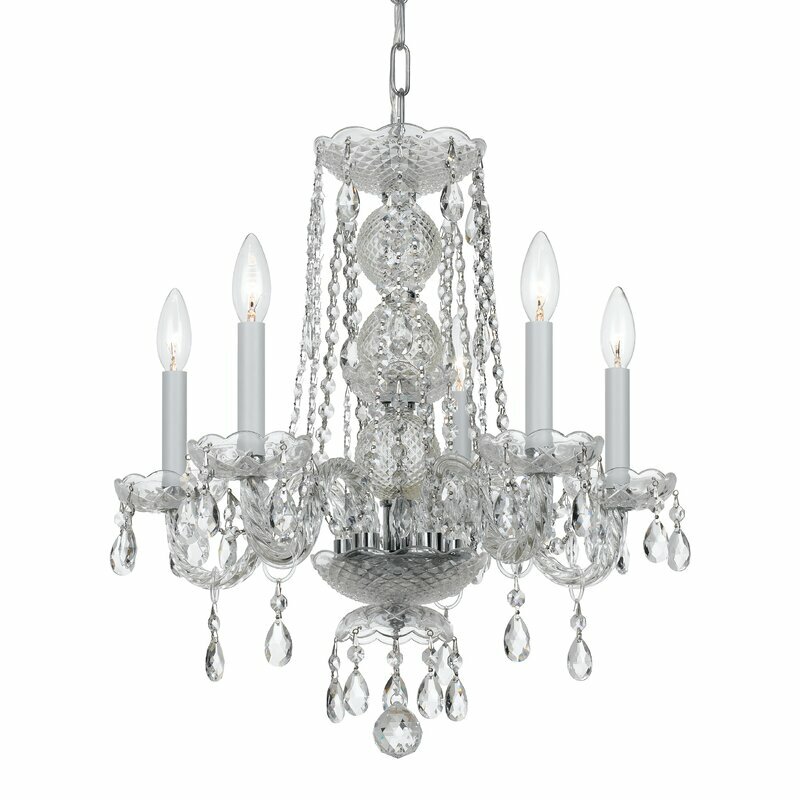 But that doesn’t mean you can’t steal the look for a bedroom, living room, or dining room in your own home. 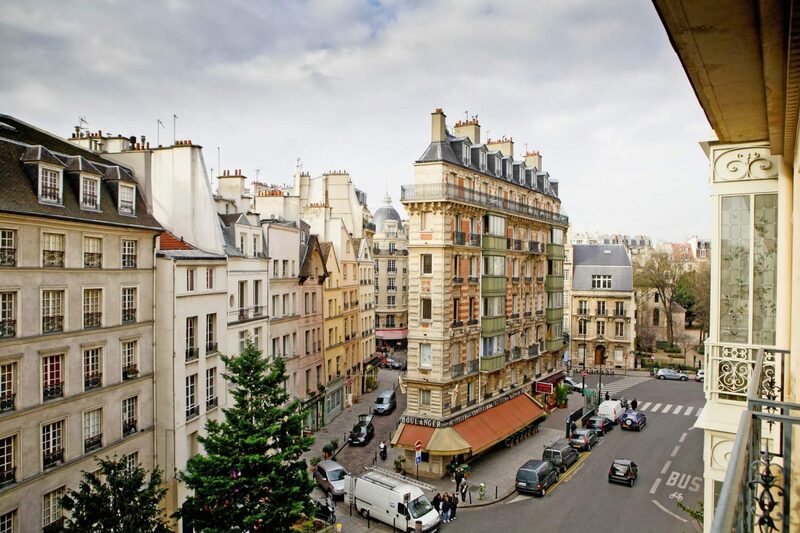 I am admittedly more of a country girl than a city slicker, but I do appreciate temporarily living like a local in cities like Paris to soak up inspiration and share it with you. 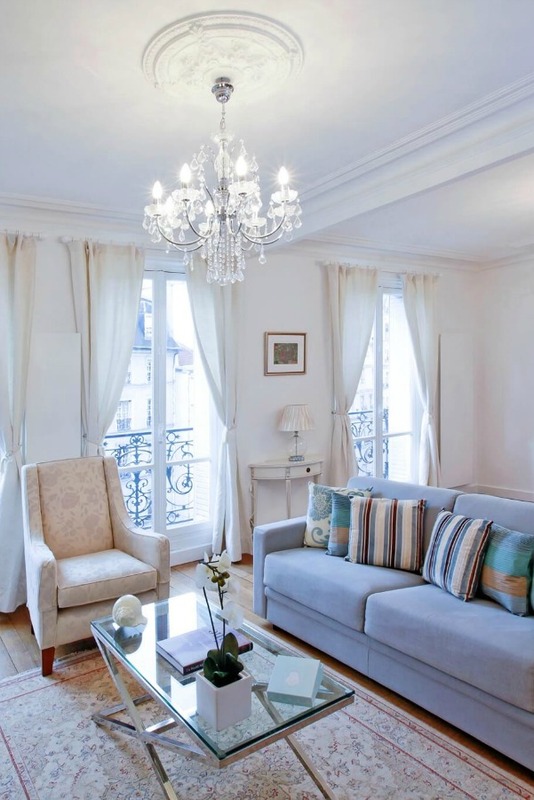 12 Paris Apartment Interior Design Ideas introduces decorating suggestions inspired by my stay in this apartment near Notre Dame. I gathered furniture and decor ideas that were mainly 3-figure rather than 4-figure, but there are a couple of Frenchie finds toward the end in the double digits! Affiliate links follow and won’t cost you a cent more to use them as they may earn this blog a small commission. HINT: If any of the decor appeals and you want to refer to it in the future, simply pin it to a designated Pinterest board so you’ll be able to easily refer to this post when you need it! 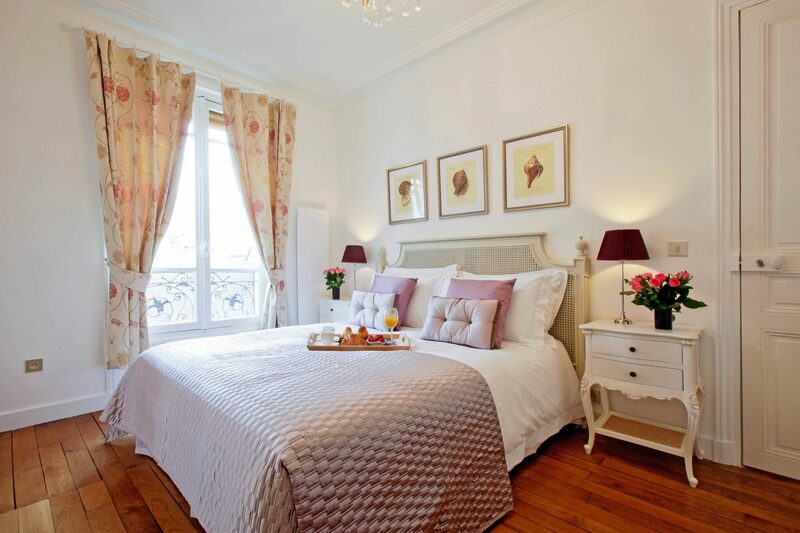 What made this particular Paris apartment bedroom romantic in style for me were its: sparkly semi-flush mount lighting, the use of lavender as an accent, the wrought iron balcony, country French furnituree, aged rustic wood floors, vintage door, and rich architectural moldings. 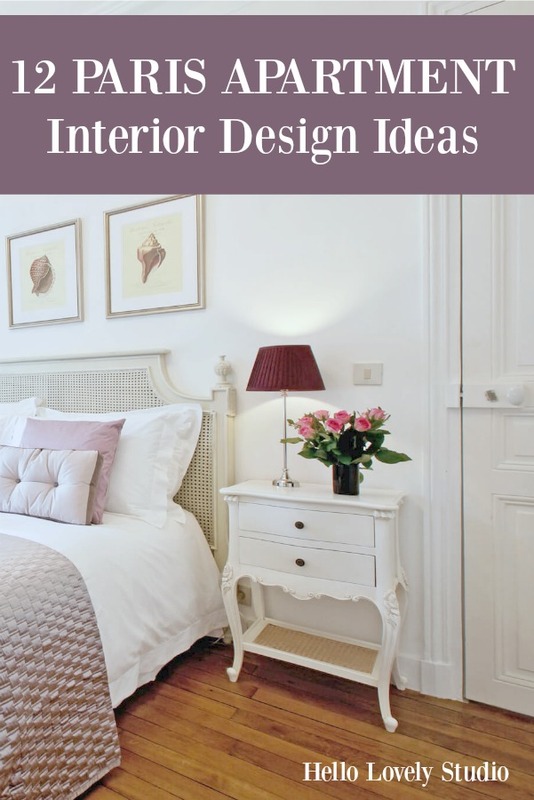 While the architectural details may not strike you as budget friendly – that does depend on your level of DIY acumen and relativity of budget. Adding a more sizable baseboard is a change out that can improve the bones of your room and heighten its character. 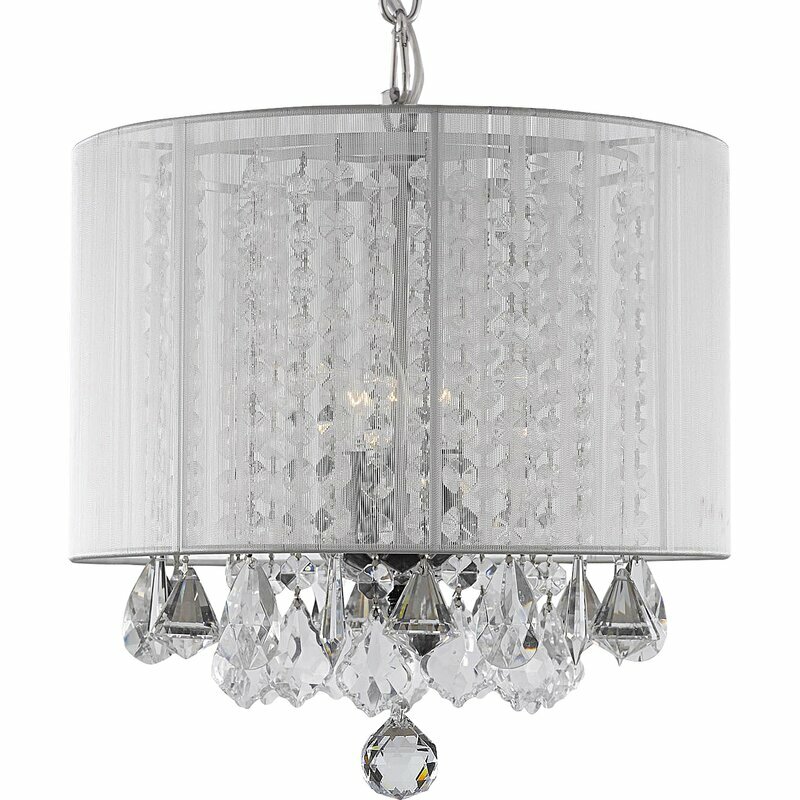 Crystal 35″ Table Lamp: FIND HERE. Wanna snag vintage bedroom furniture? Take peek at what is RIGHT HERE. 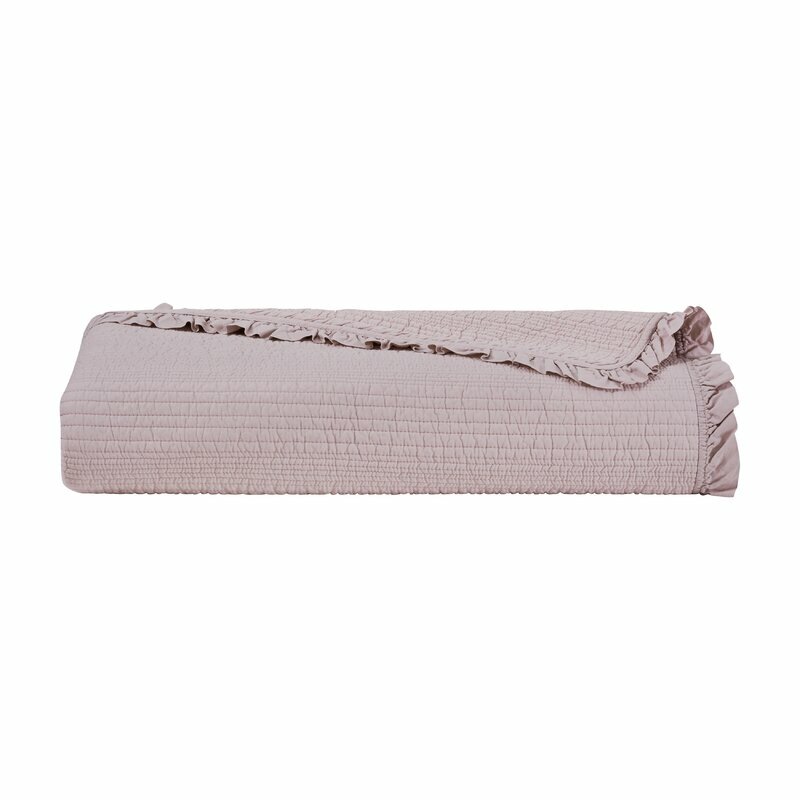 Lavender Quilted Coverlet: FIND HERE. 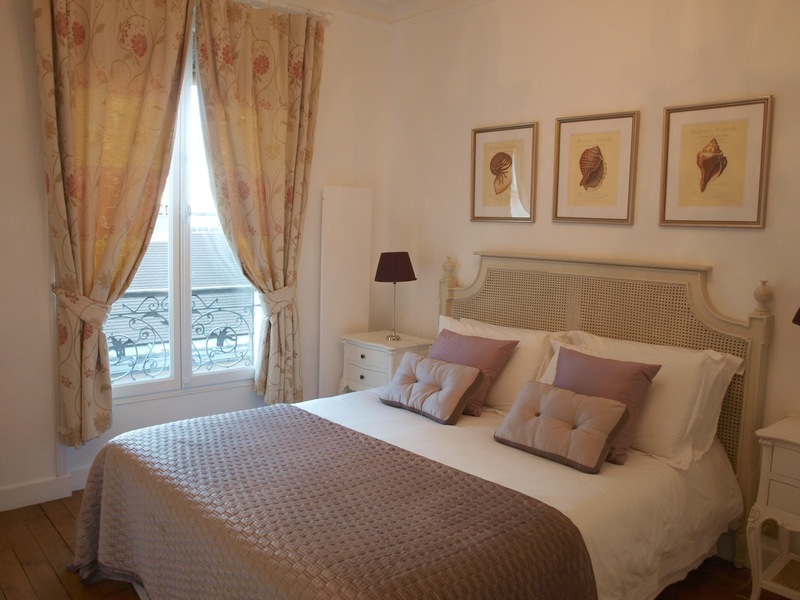 The bedroom in this pricey Paris apartment we rented didn’t even have a closet! 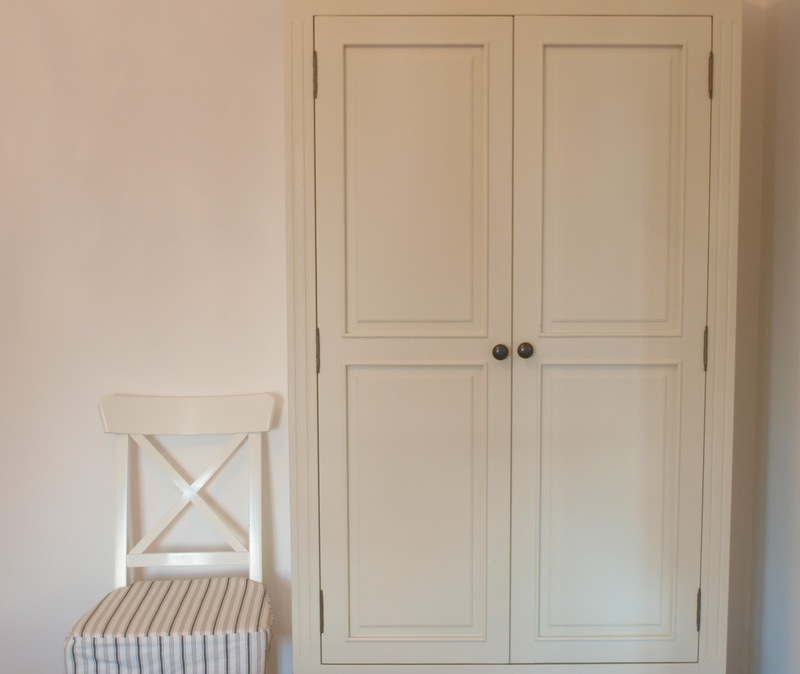 This Nordic style armoire was the only clothing storage–there’s something to feel thankful for if your bedroom comes with any sized closet at all. 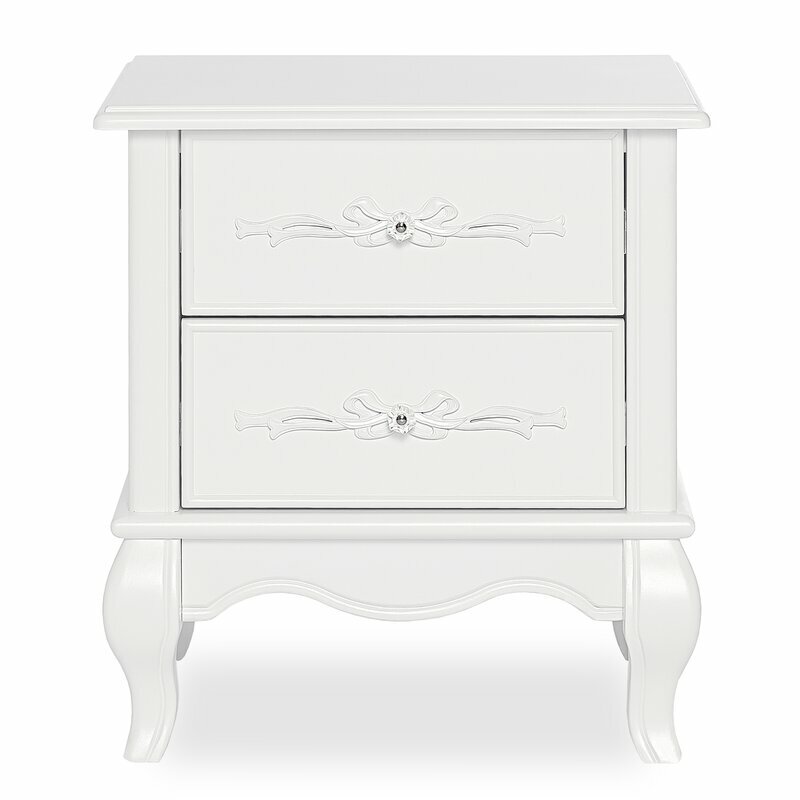 French country nightstand: FIND HERE. 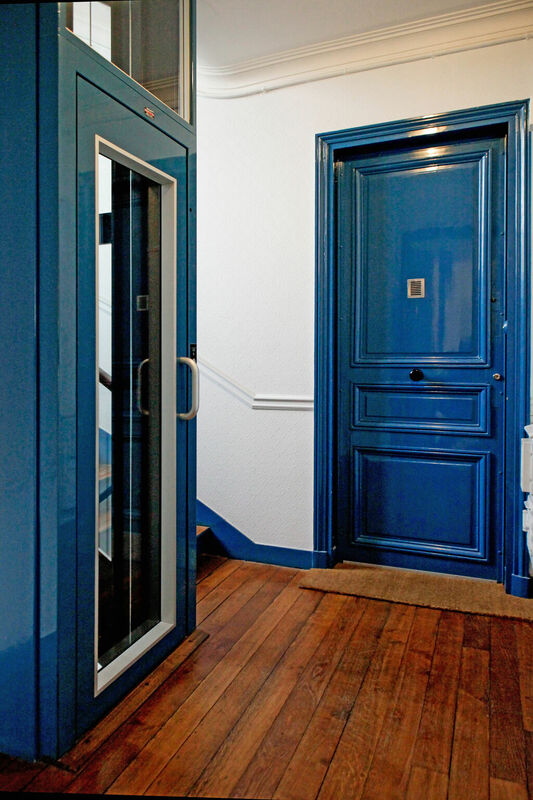 This Paris apartment’s doors were magnificent and painted this striking French blue. Paired with the gold toned hardware, ooh la la. You can steal this idea for your own home, and you’ll be hard pressed to find a more budget friendly idea. If your home is graced with less-than magnificent hollow-core builder’s grade doors, consider painting them a cheery shade. You may recall that when we moved into our fixer upper and inherited cheap, paper-y 6-panel doors, I painted them light grey (leaving the trim white) since I had to live with them for awhile before replacing them with solid alder doors. You certainly don’t have to keep the color subtle as I did! Just look at the blue and be inspired! 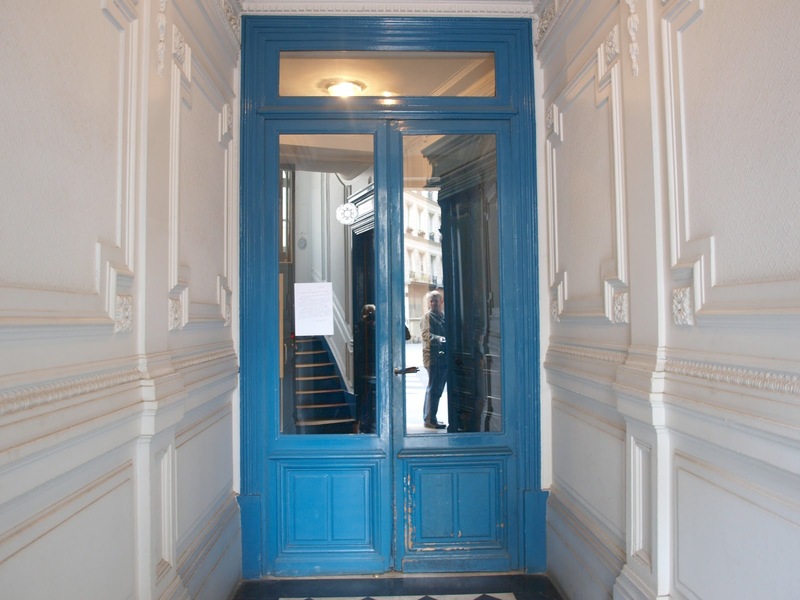 The same blue was used around the “lift” and entry doors. 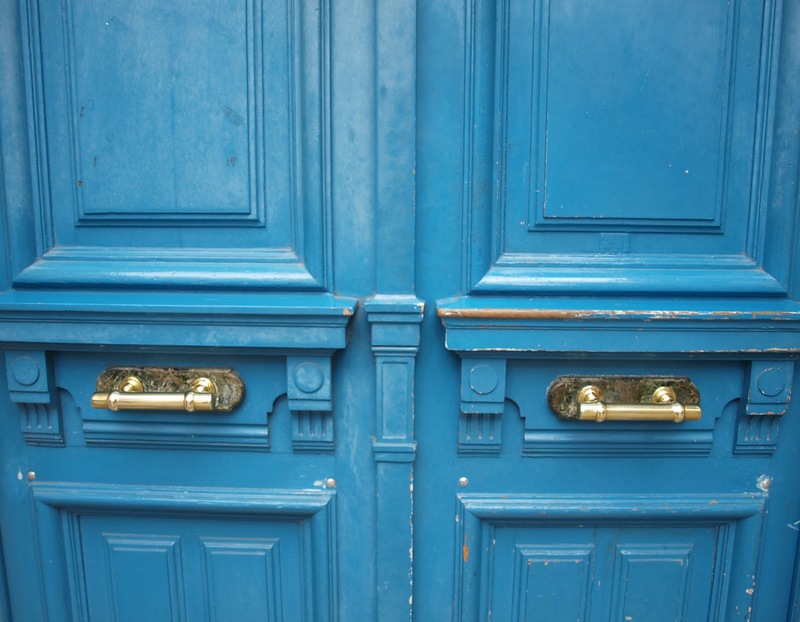 Blue doors were everywhere in the building. 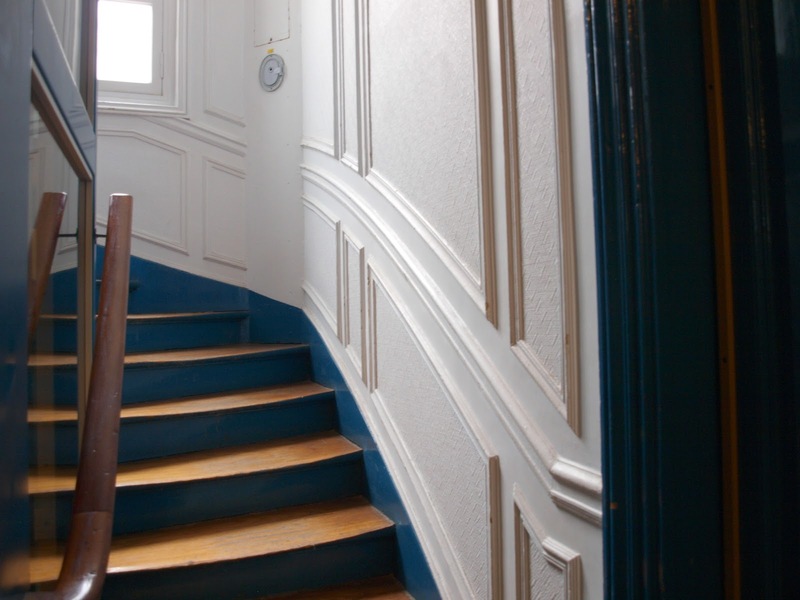 And notice the strip of blue near the stairs – did you need permission to use color on doors and trim while leaving surrounding trim white or stained? You’re welcome! 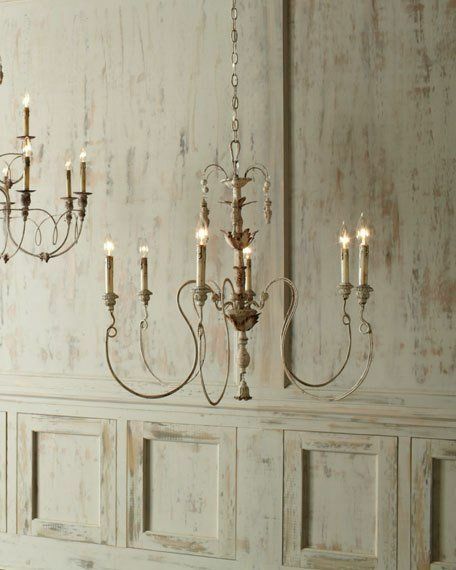 If you’re searching for just-right white paint colors, do SEE THIS. 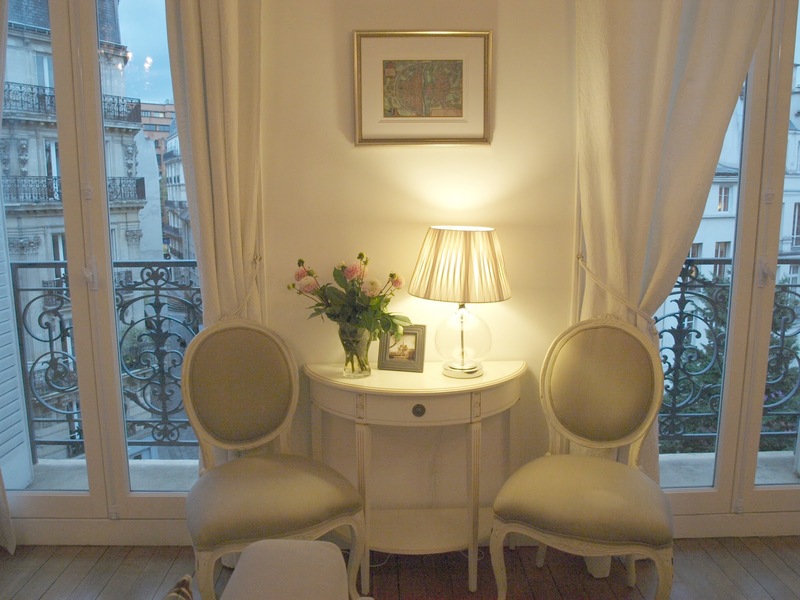 Were I to guess at the white paint color used throughout this Paris apartment we rented, I would say BENJAMIN MOORE White Dove. The white hardly changed through the day, and it was a soft creamy pure white without yellow or grey undertones. 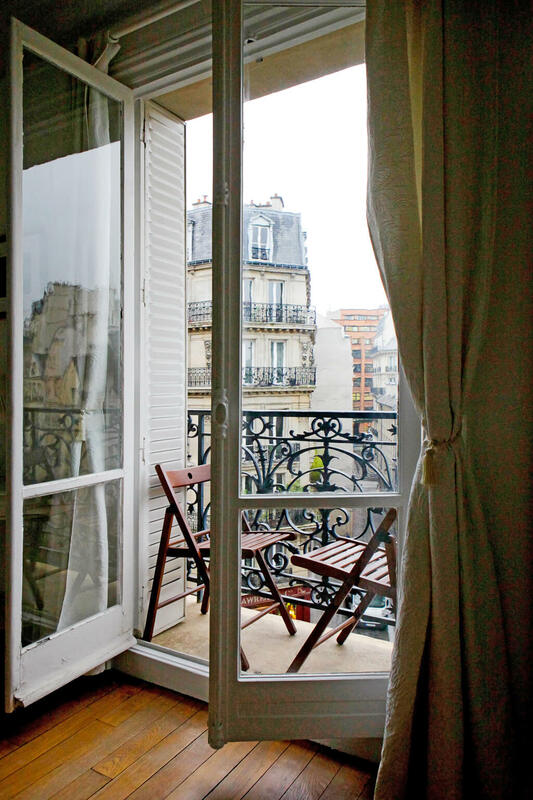 How to emulate the feel of wondrous French doors opening to beautiful wrought iron balconies AND do it on a budget? To capture the effect, my first advice is to direct your attention to the windows in the room and determine the amount of privacy you require. Also consider glare if the room is also used for television viewing during the day (if you only watch movies at night, maybe you can let go of window coverings). Find Demilune Side Table options here. 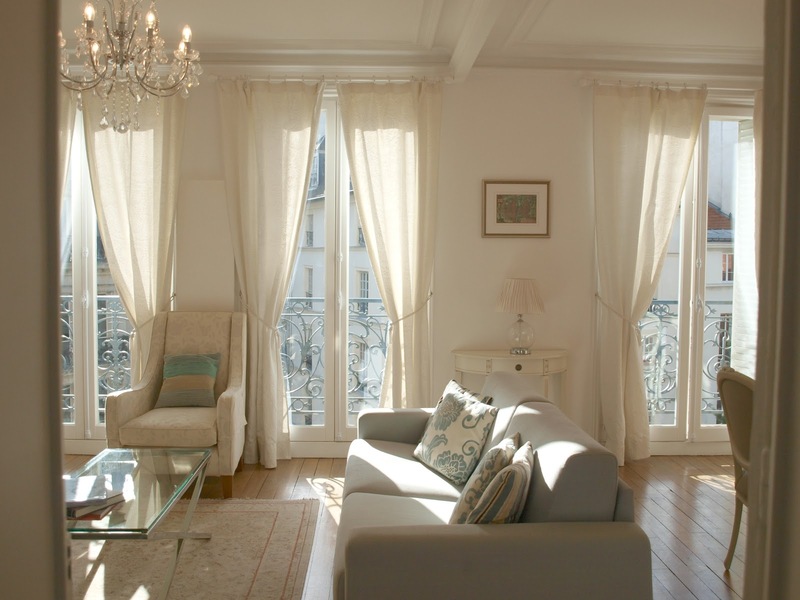 If you can get by without window treatments, consider nothing at all or curtains that can be pulled back as you here. 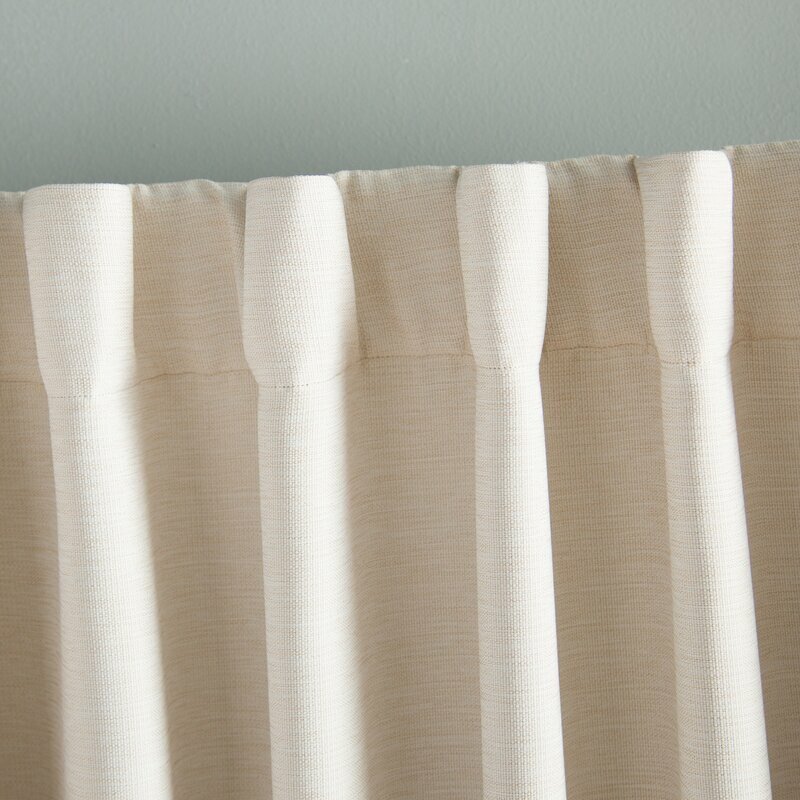 Single Rod Pocket Curtain Panel: FIND HERE. 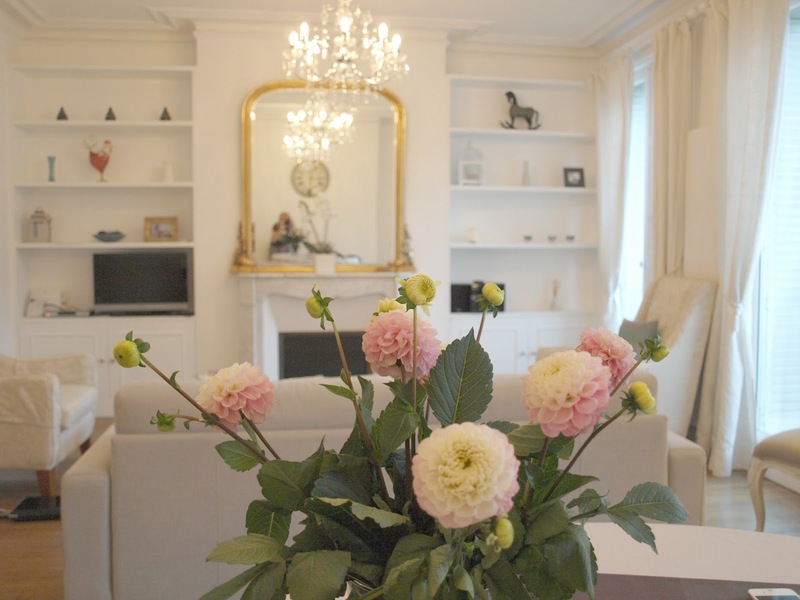 Loved the fresh flowers awaiting us in this apartment! See lovely floral inspiration in THIS POST. 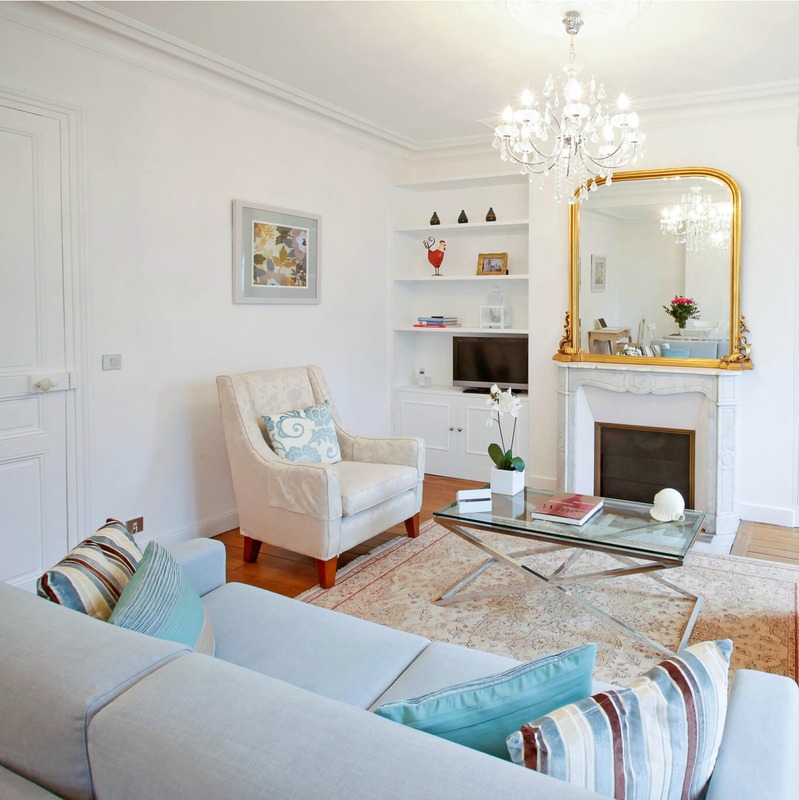 Quiet light blue can be a beautiful neutral foundation as it is in this Paris apartment living room. 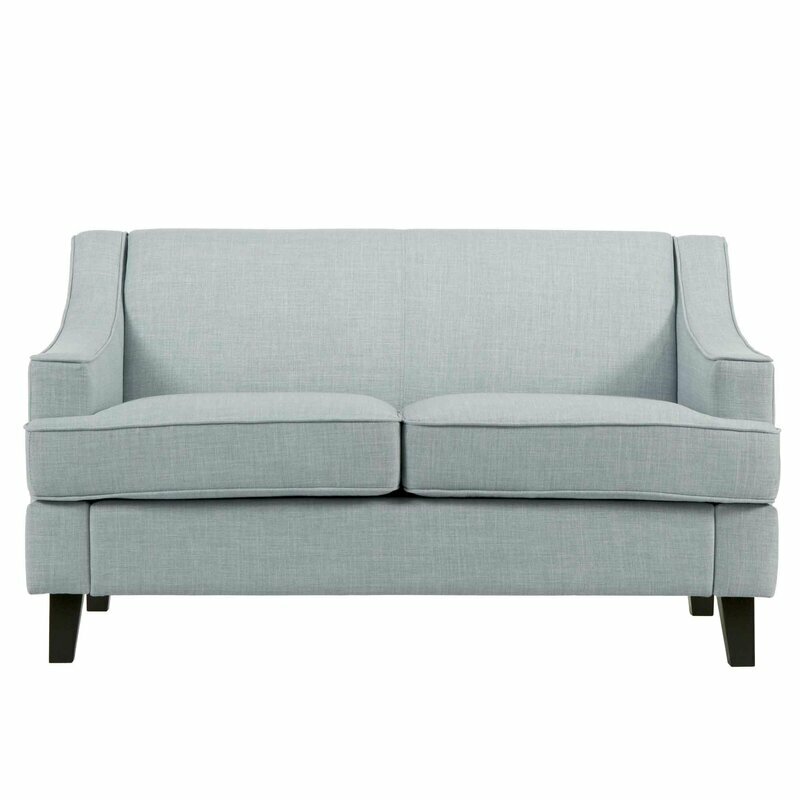 Hushed Blue Sofa: FIND HERE. Light Blue Loeseat: FIND HERE. 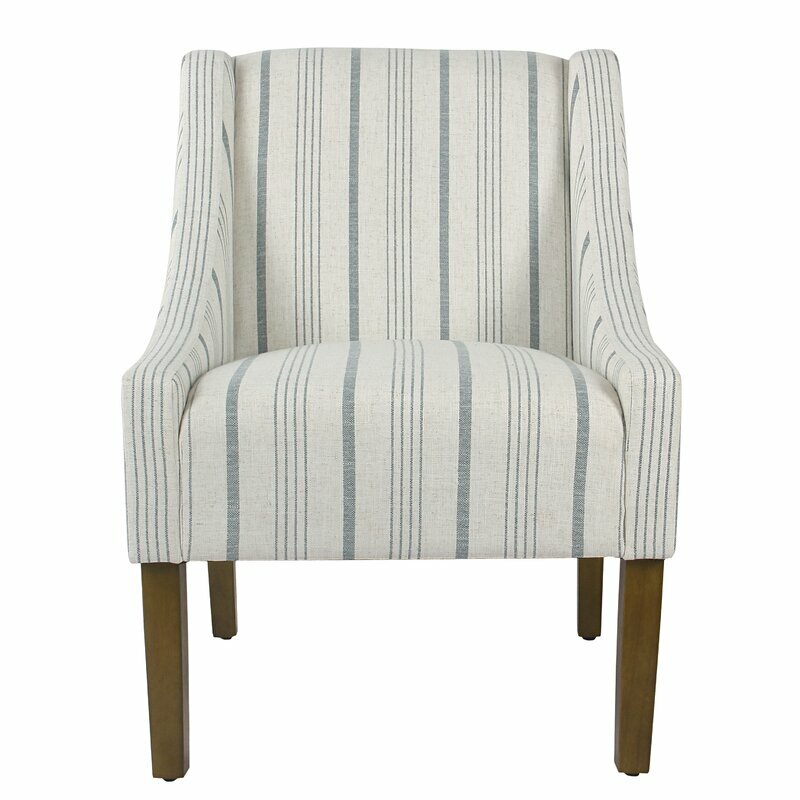 Light Blue Stripe Side Chair: FIND HERE. 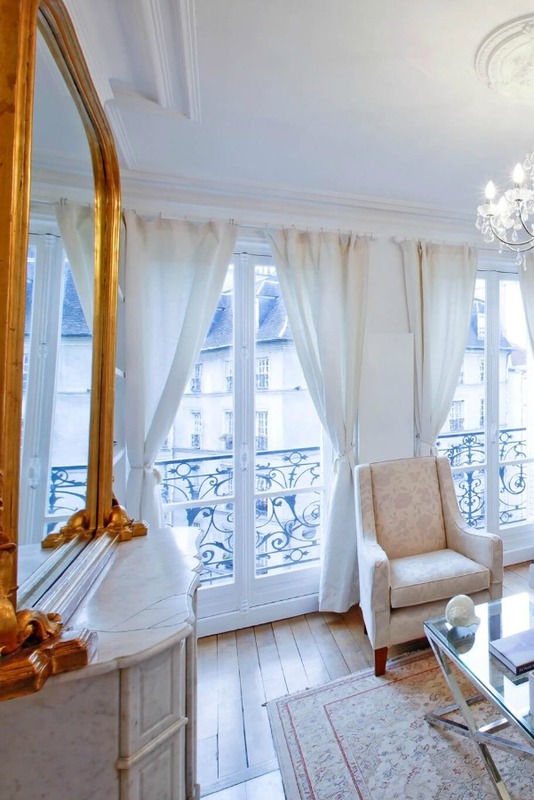 Whether on a picture frame, a painting, or a mirror, a rich gold frame is very at home in a Paris apartment. 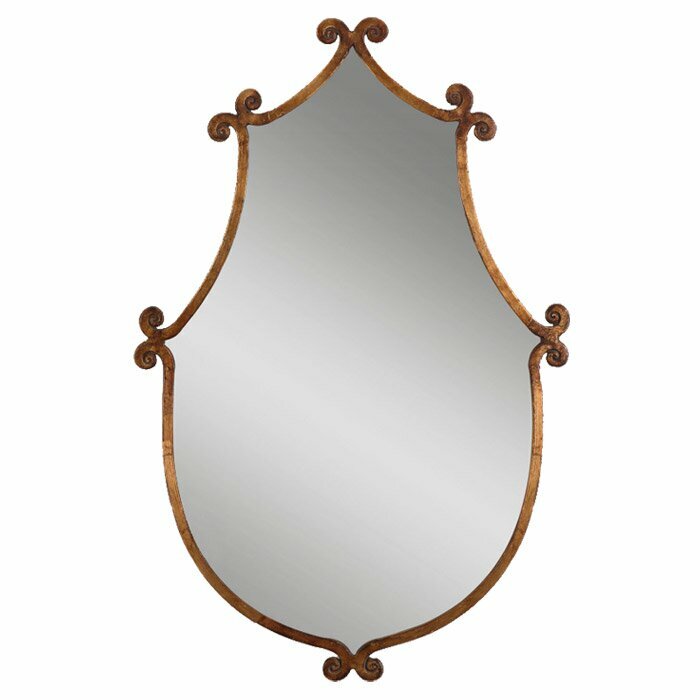 Find options for vintage French gilded wall mirrors RIGHT HERE. 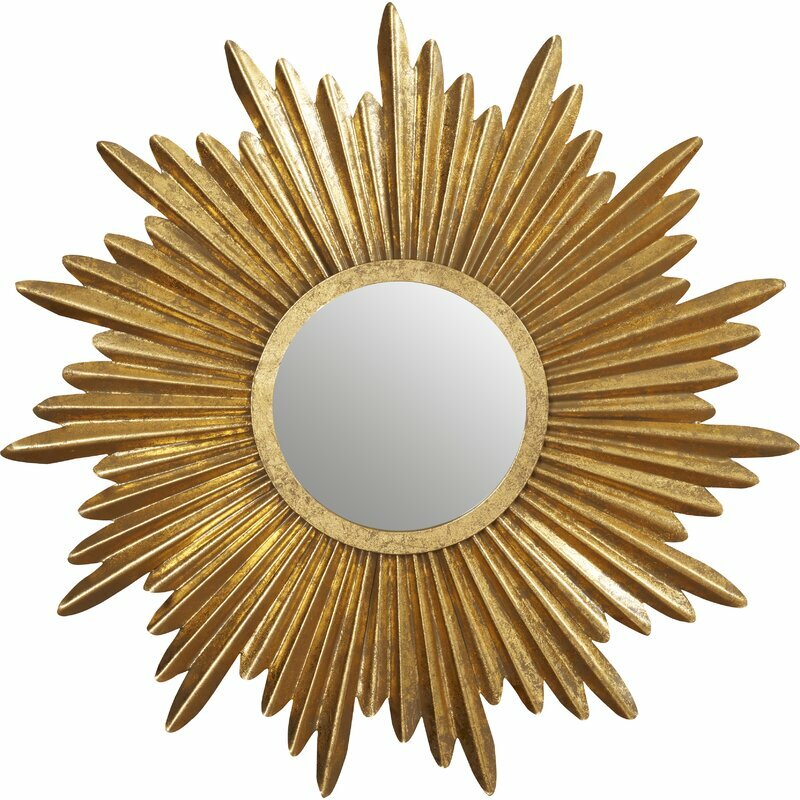 Sunburst Gold Mirror: FIND HERE. More Gold Framed Mirror Options RIGHT HERE. 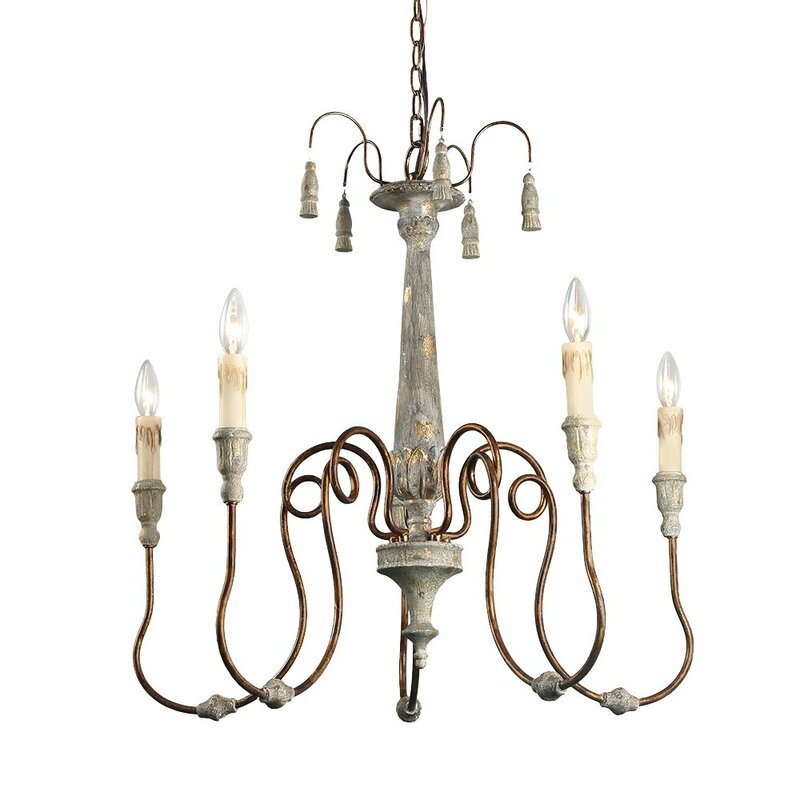 If your space is lacking these Juliet iron balconies – keep your eyes peeled at the flea market for architectural salvage pieces (gates, fences, exterior ornaments) which may make the perfect accent piece. Don’t worry about the color since you can always tweak that! Here’s what you see when you gaze to the right. And this is the view to the left. It was wonderful to have grocery stores, bakeries, and shops selling vintage wares just outside the door! 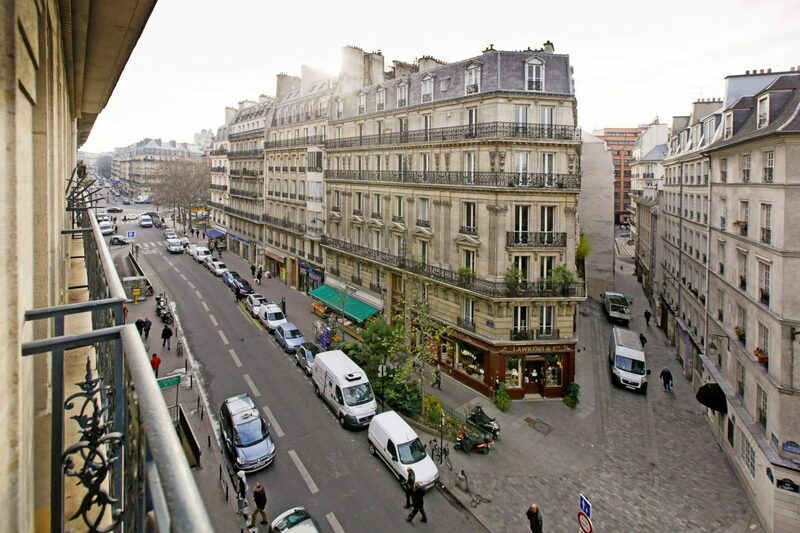 The balconies are narrow and barely accommodate a table and chairs! 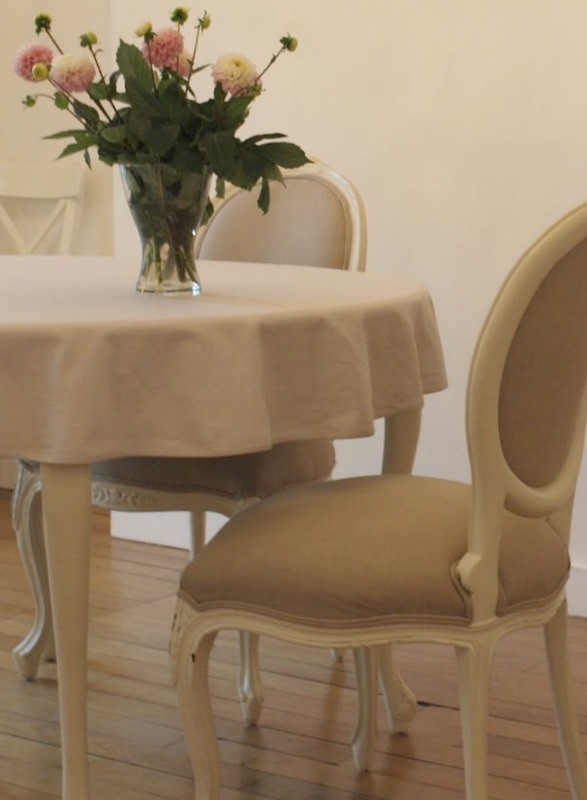 The dining room is open to the living area in this Paris apartment and consisted of a round dining table, simple chairs, and a small desk with a computer. 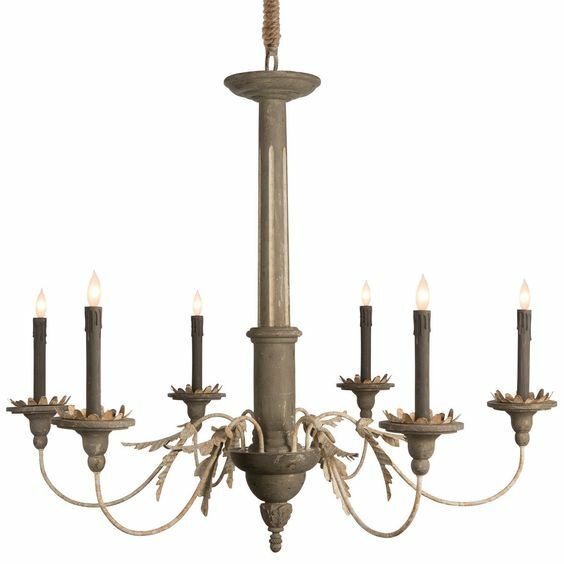 A chandelier is accented with a gorgeous ceiling medallion, and the only decor on the wall is a large clock (both decorative and functional!). 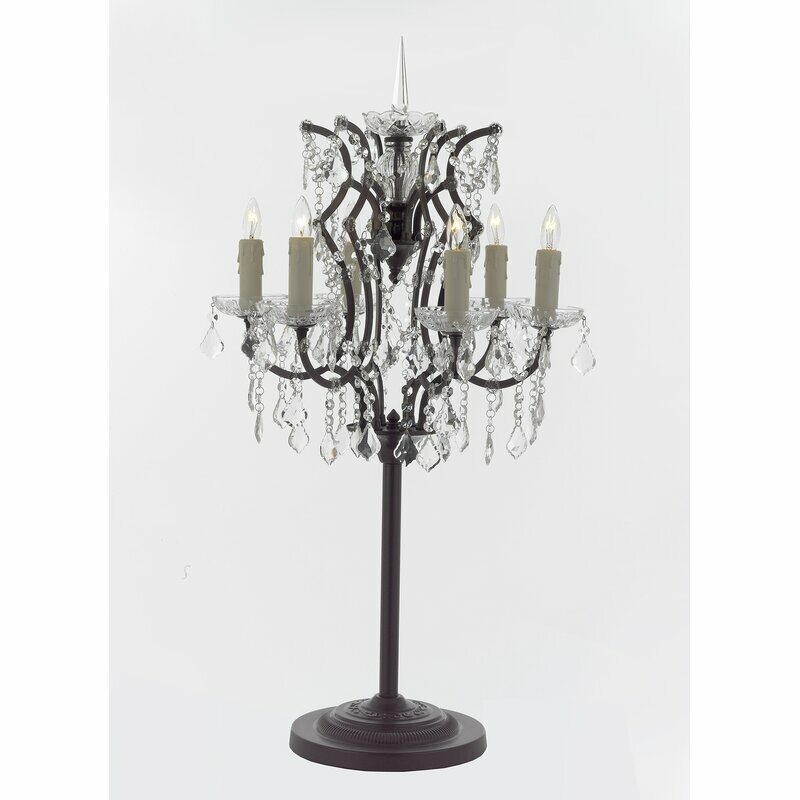 These are less “Marie Antoinette” and perhaps more at home in a Country French dining room, but the drama is still there. 11. Here are ideas for WALL CLOCKS. 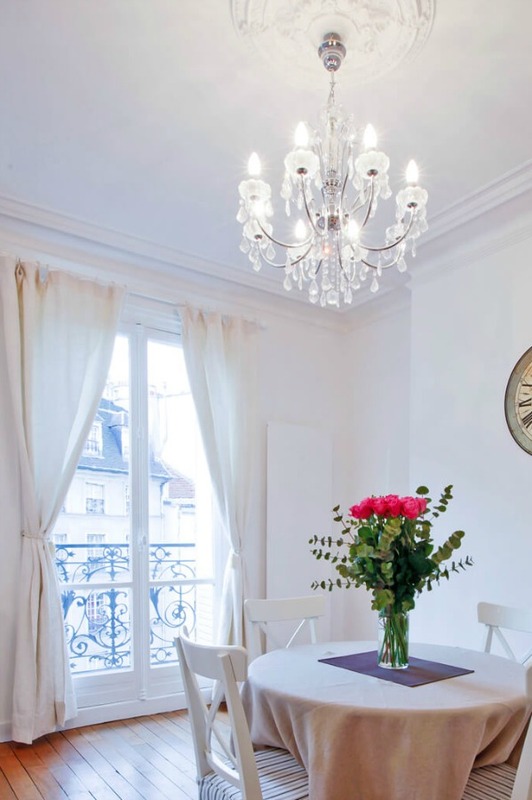 Paris apartment dining room. Hello Lovely Studio. French dining room. In case you’re in the mood for…Parisian Design Details and French Decor Finds. Certainly lovely indeed! Photo: Hello Lovely Studio. 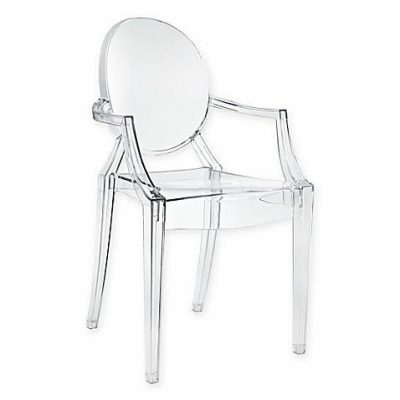 For a modern acrylic Louis chair…these are the exact ones I own, and they are both comfy and stackable. Louis Ghost Chair: FIND HERE. 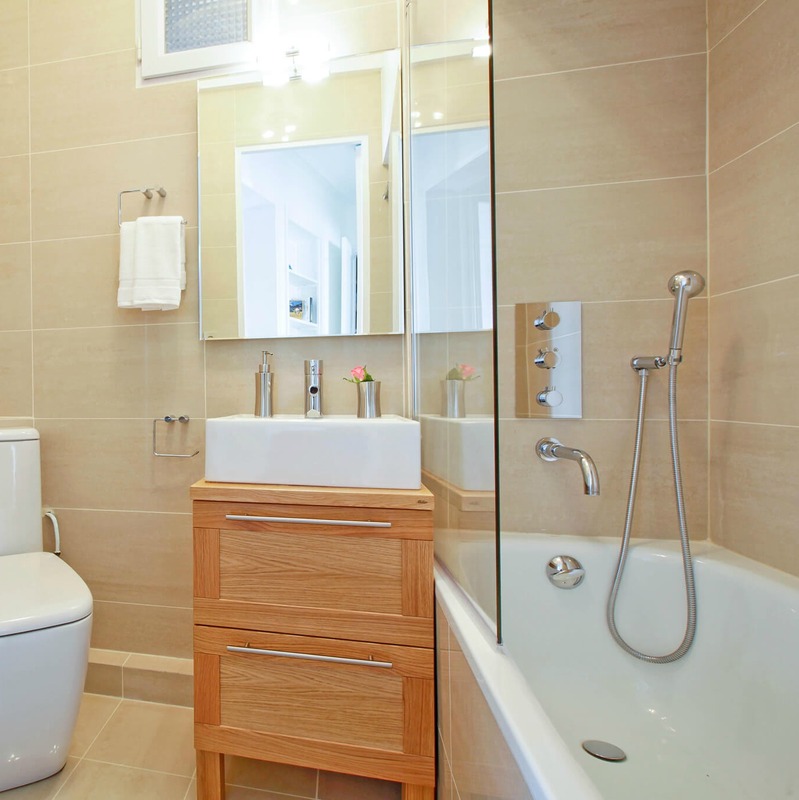 I loved the bathroom in our Paris apartment. It was light, bright, and so efficient. 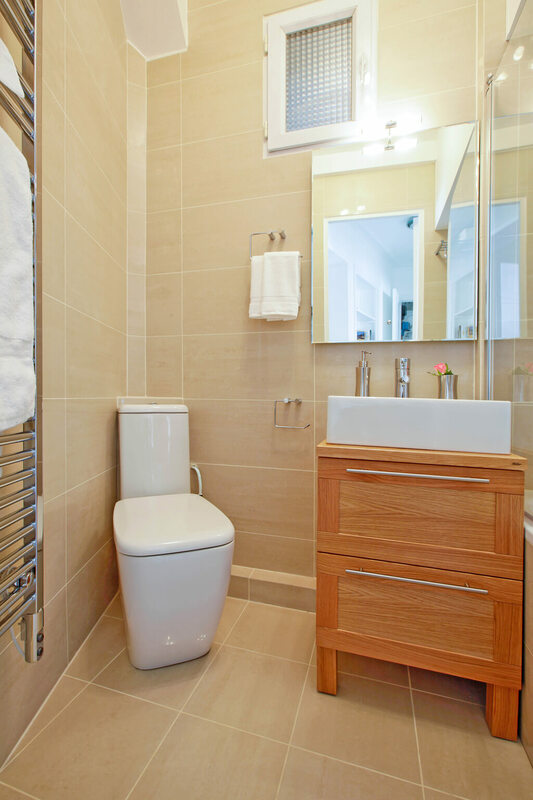 The use of a small space was a testament to European genius. 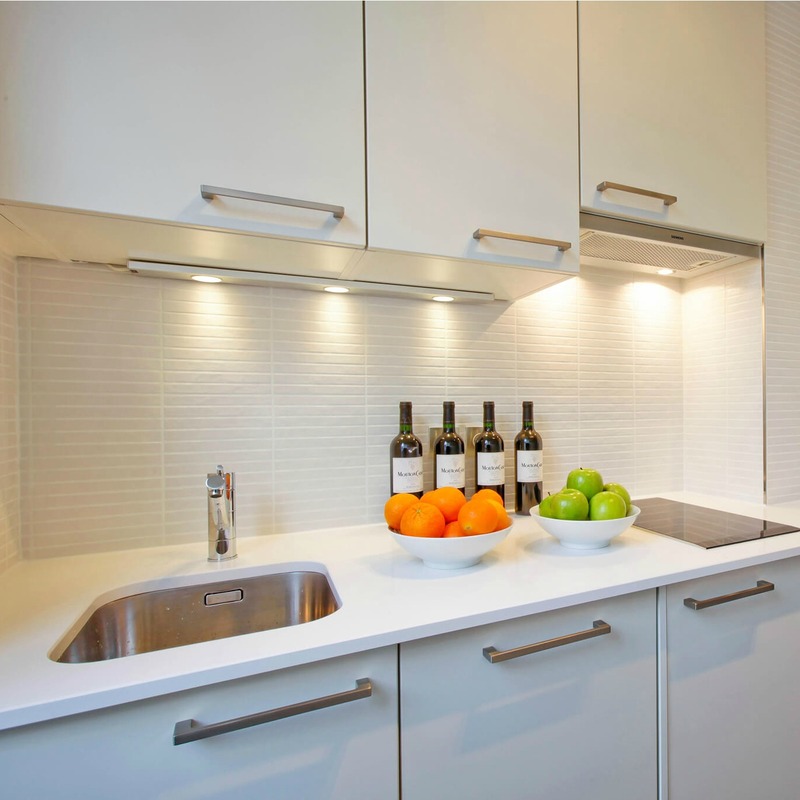 A tiny modern white kitchen with a view of beautiful rooftops. One of my favorite design details is the reflective flooring – it may look black, and black and white kitchens are certainly classic and popular – but it is navy blue. View out the kitchen window was so enchanting and such a glorious contrast from the sleekness and modernity of the kitchen fixtures. 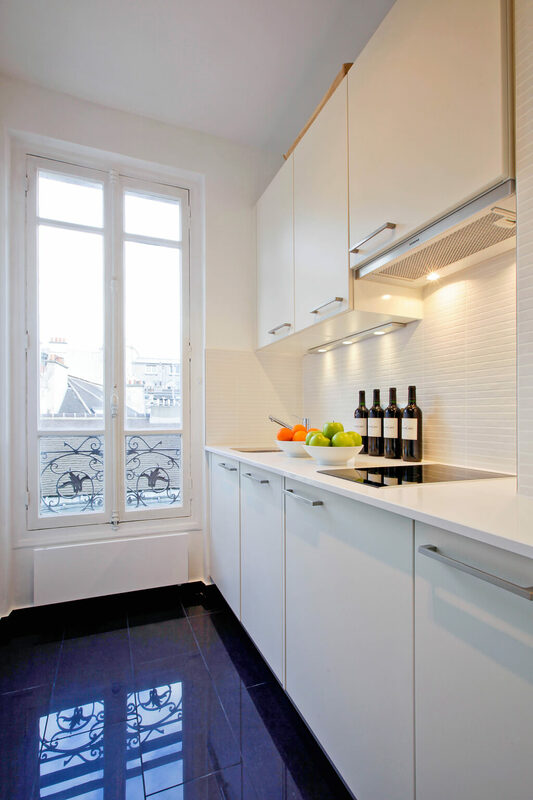 Wine as decor in a white kitchen? Why not! Here’s my favorite source! 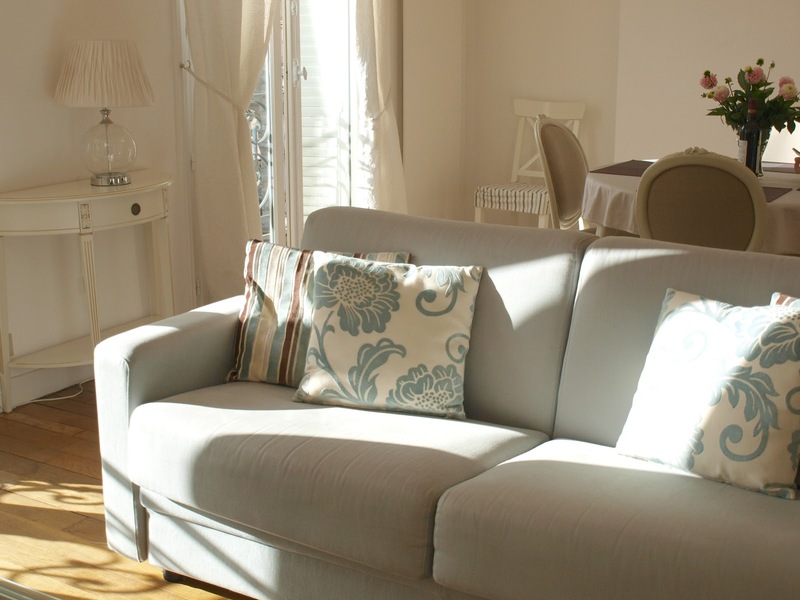 Get the full scoop on staying at this Paris apartment at Haven In. 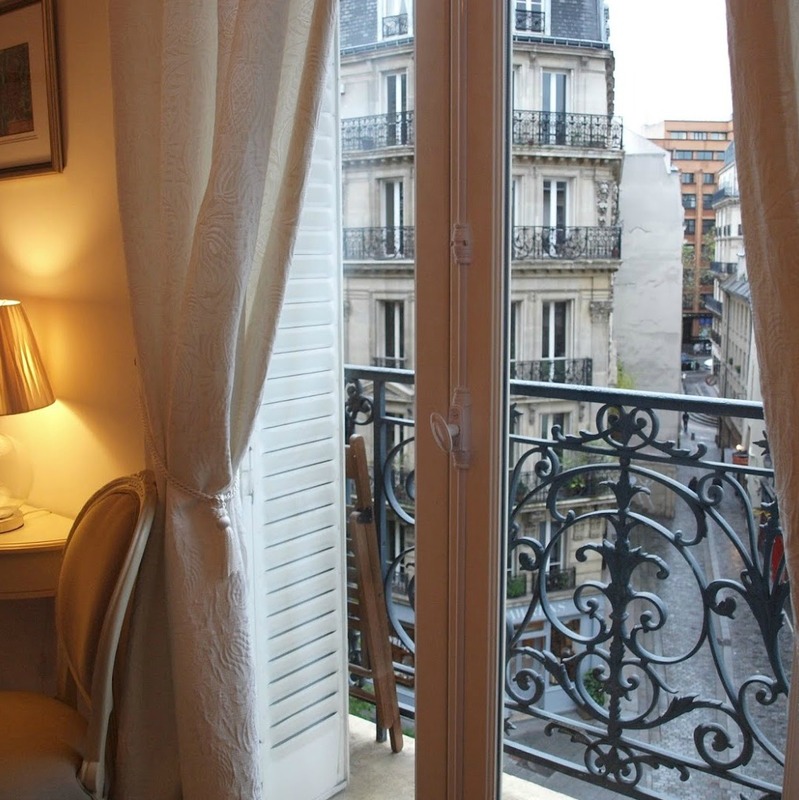 Paris apartment balcony and shutters. 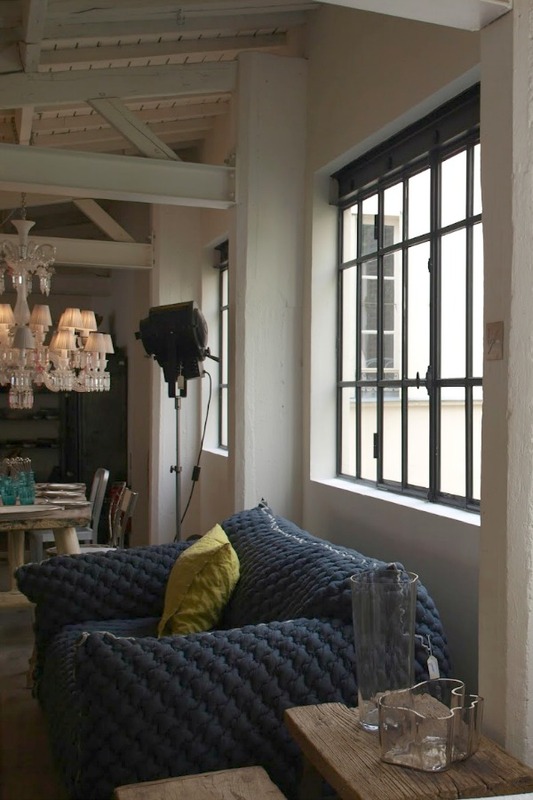 In case you’re in the mood for…Parisian Design Details and French Decor Finds. Certainly lovely indeed! Photo: Hello Lovely Studio. 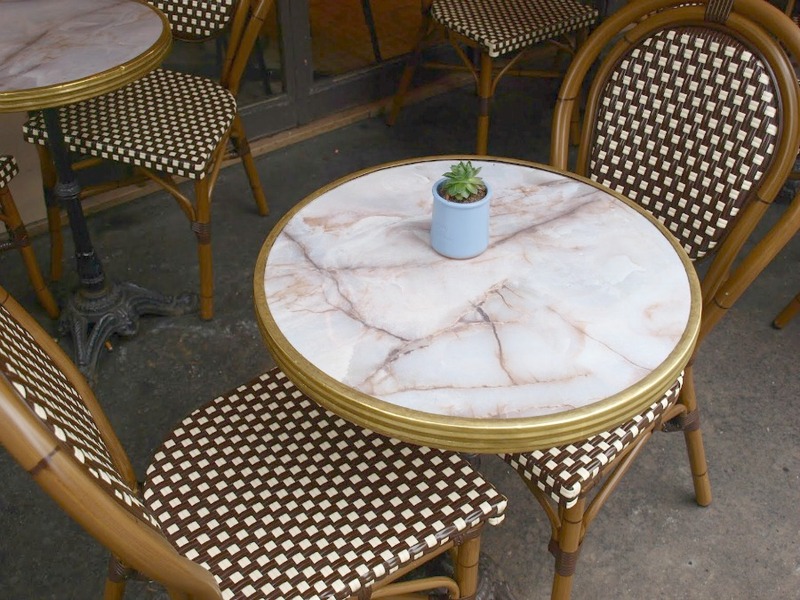 Parisian bistro tables and chairs are such iconic eye candy. I saw the little recycled blue yogurt pots used as vases everywhere, and I brought home as many as would fit in my suitcase. It’s interesting that I snapped this photo below in 2012, when succulents were not yet EVERYWHERE in the USA. A cafe in Paris. 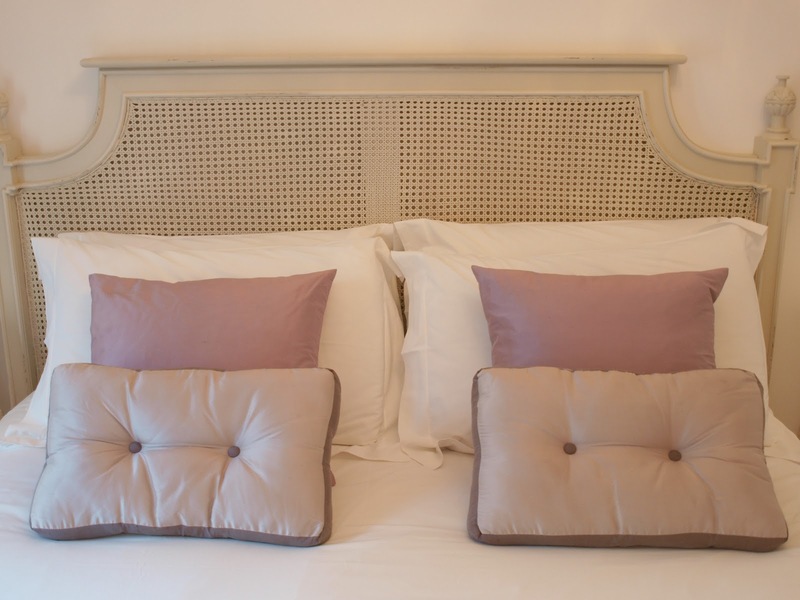 In case you’re in the mood for…Parisian Design Details and French Decor Finds. Certainly lovely indeed! Photo: Hello Lovely Studio. 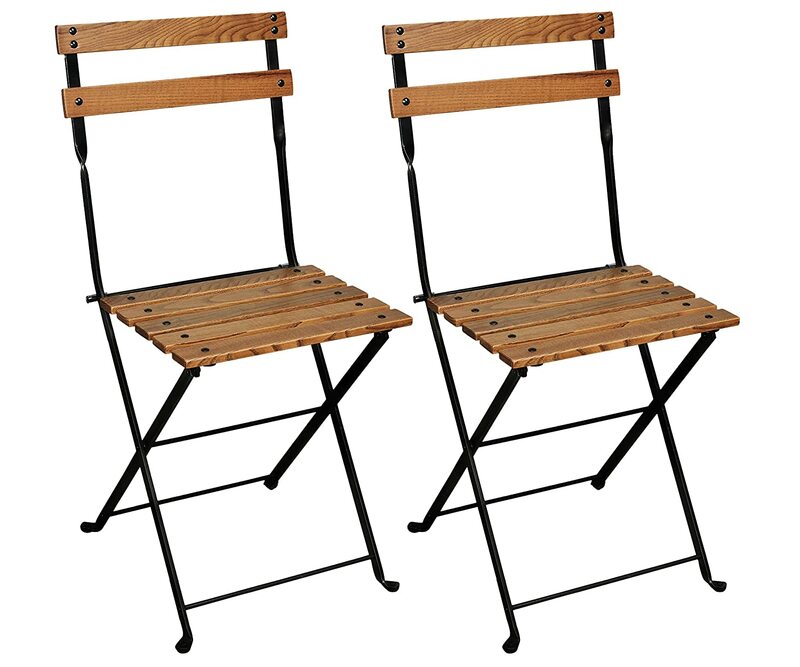 See this post for bistro chair ideas.. 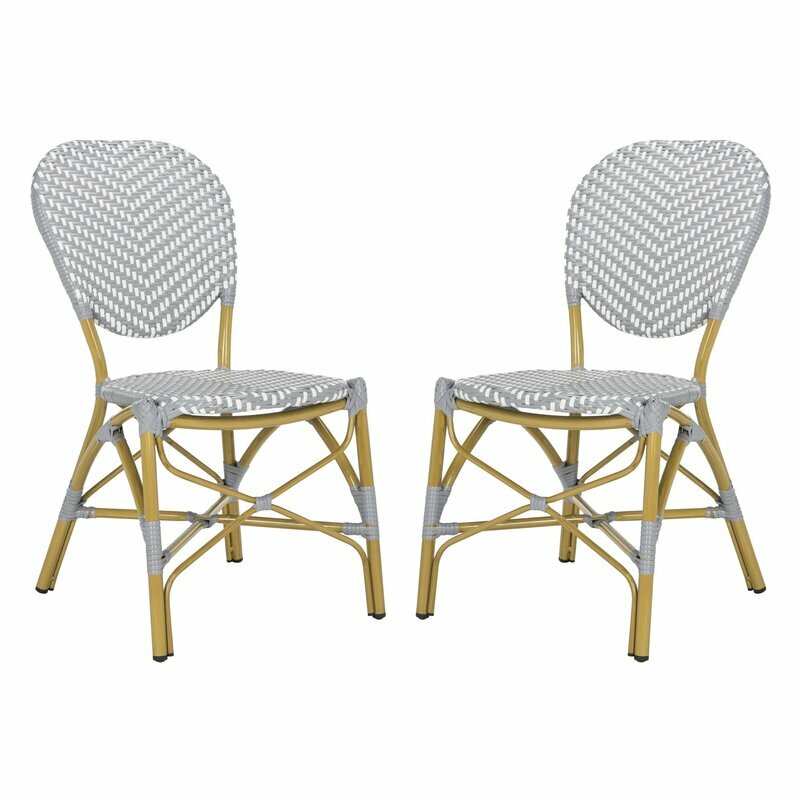 While this friendly-priced bistro set below wouldn’t be at home in this chic apartment, it’s Christmas-y green color spoke to me. The quiet beauty of the architecture was intoxicating. 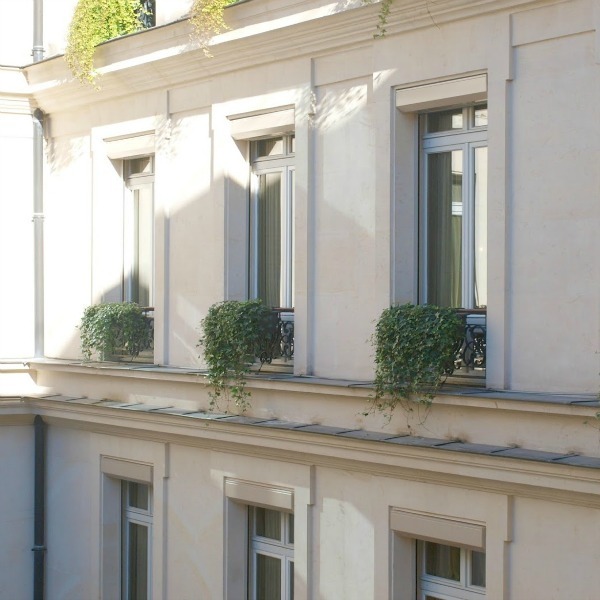 Ivy spilling from window boxes in courtyard of Park Hyatt Paris Vendome. In case you’re in the mood for…Parisian Design Details and French Decor Finds. Certainly lovely indeed! Photo: Hello Lovely Studio. Another gorgeous window and completely different…industrial steel windows that feel modern and work so well with any design style. If you read my post highlighting Chateau Domingue, you may recall they offer these custom made thin steel beauties. Furniture at Merci store in Paris. 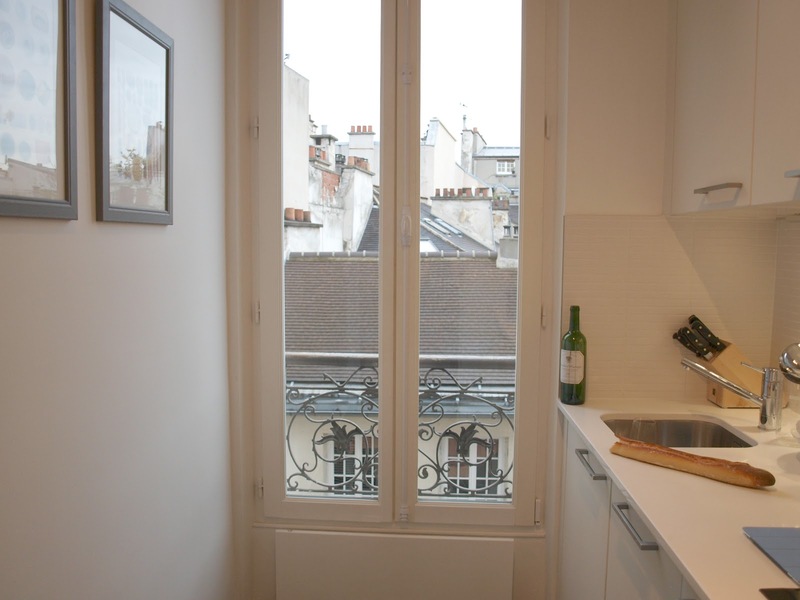 In case you’re in the mood for…Parisian Design Details and French Decor Finds. Certainly lovely indeed! Photo: Hello Lovely Studio. Is there anything quite like old hardware – functional art work to enjoy everyday? 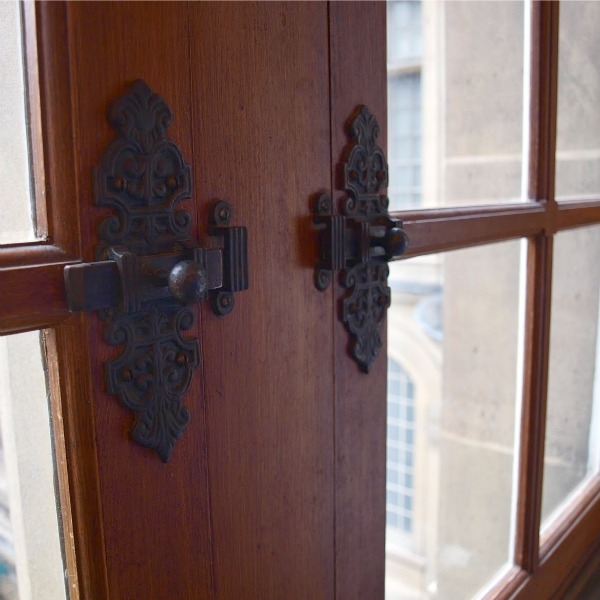 Antique hardware on windows at Hotel Carnavalet. 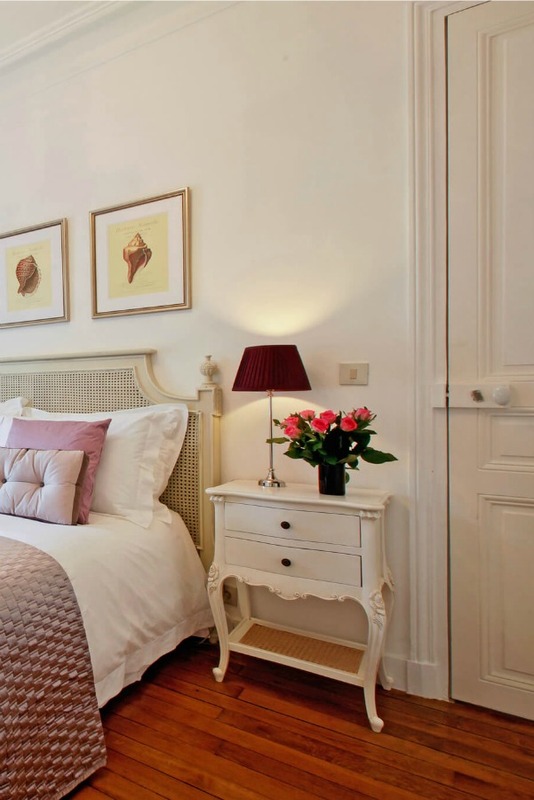 In case you’re in the mood for…Parisian Design Details and French Decor Finds. Certainly lovely indeed! Photo: Hello Lovely Studio. This window was in the dressing area of our hotel room’s bathroom, and you will note the richness of the gold-leafed wood. 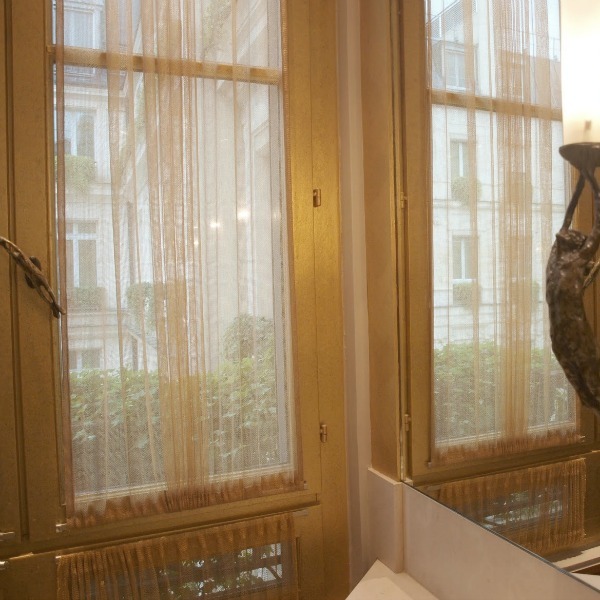 Gold window trim in Park Hyatt Paris Vendome bathroom. In case you’re in the mood for…Parisian Design Details and French Decor Finds. Certainly lovely indeed! Photo: Hello Lovely Studio. In our hotel room’s bath, there were so many elegant design details to note! Creamy honed marble, gold plated hardware, and no subway tile in sight. 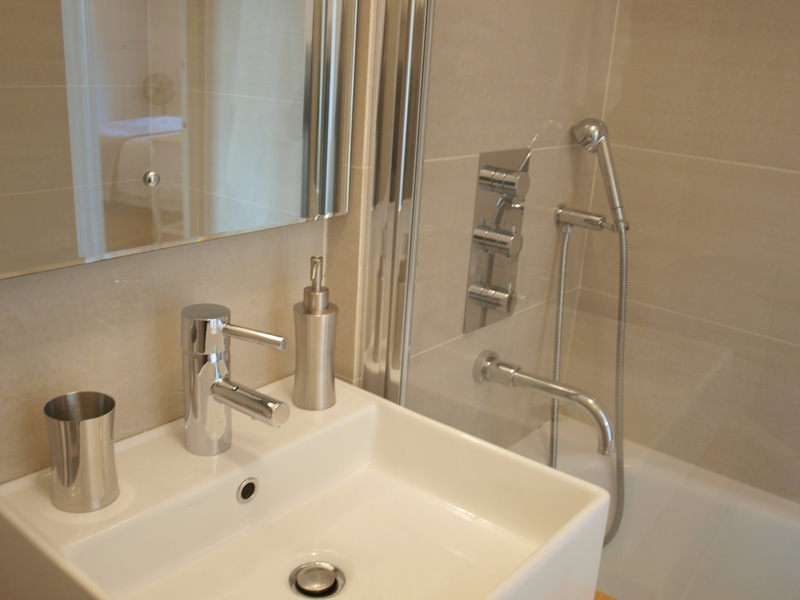 Luxurious marble bathroom in our hotel room at Park Hyatt Paris Vendome. 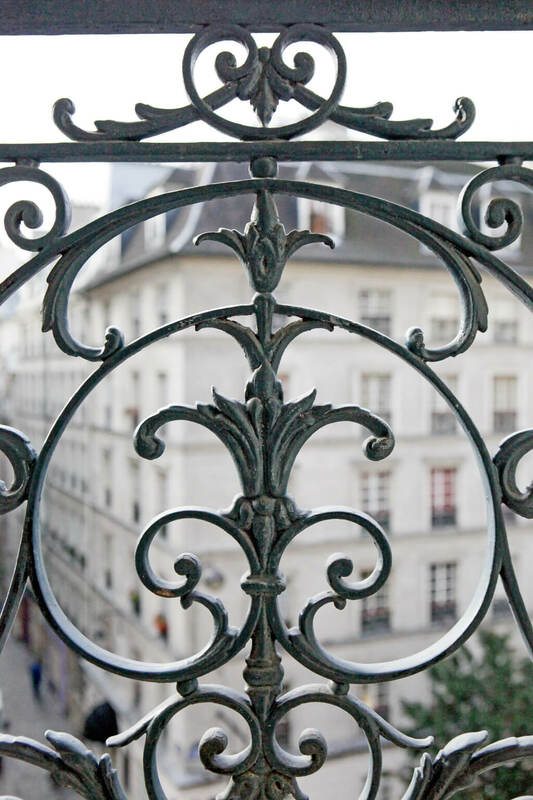 In case you’re in the mood for…Parisian Design Details and French Decor Finds. Certainly lovely indeed! Photo: Hello Lovely Studio. 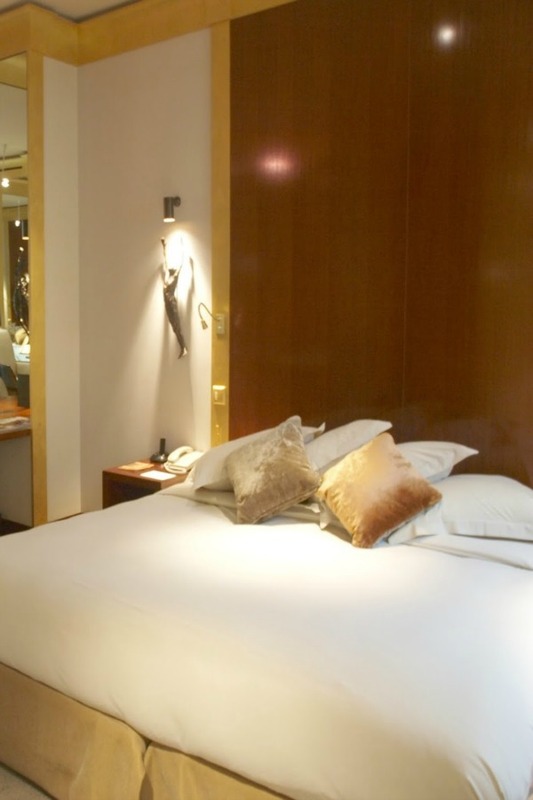 More gold leaf on the woodwork, mahogany panels, velvet pillows, and simple delicate sconces spotlighting more Rosaline Granet sculptures flanking the bed. Mahogany paneling and gold trim in our hotel room at Park Hyatt Paris Vendome. 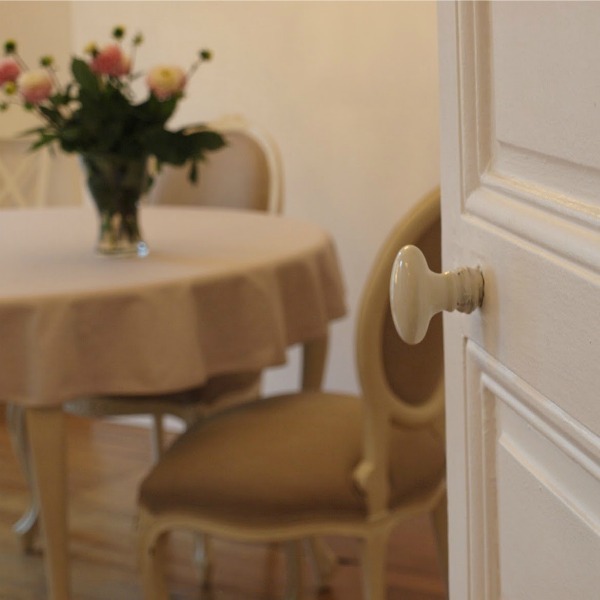 In case you’re in the mood for…Parisian Design Details and French Decor Finds. Certainly lovely indeed! Photo: Hello Lovely Studio. Here is a wood floor pattern that blew my mind. 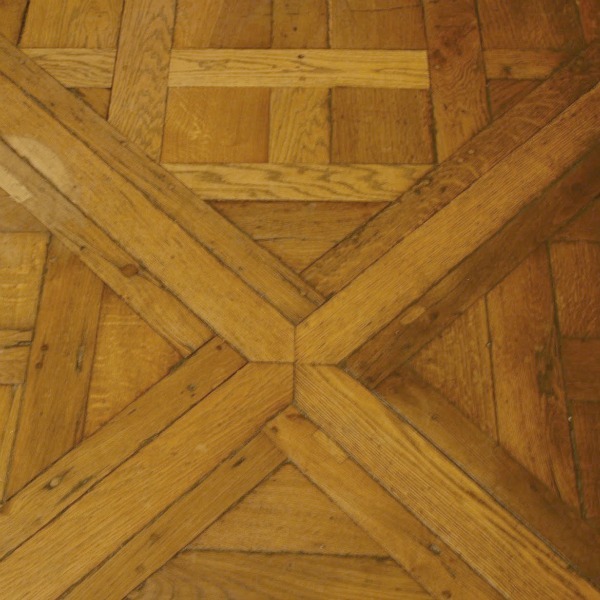 Hardwood floor pattern in Paris. 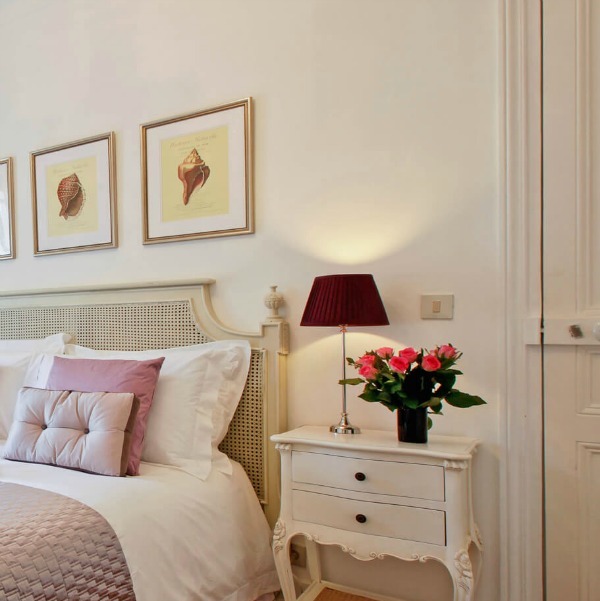 In case you’re in the mood for…Parisian Design Details and French Decor Finds. Certainly lovely indeed! Photo: Hello Lovely Studio. 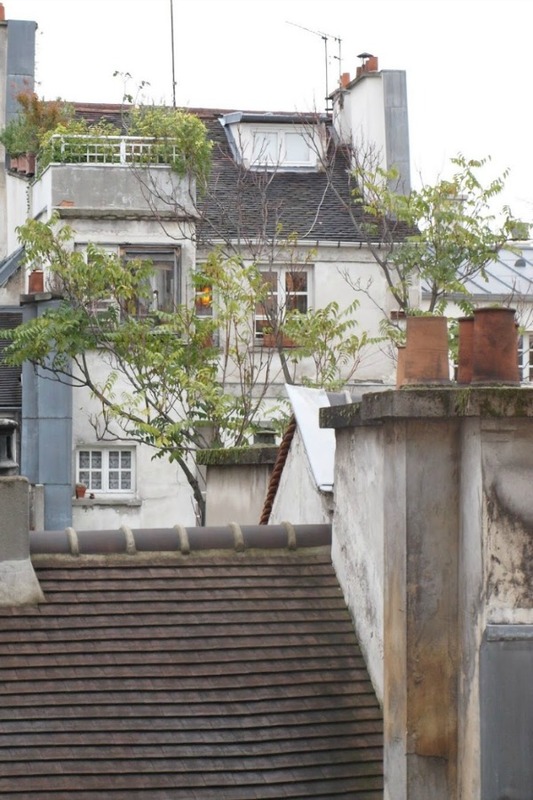 Need a great book with Paris Apartment design? SEE THESE. 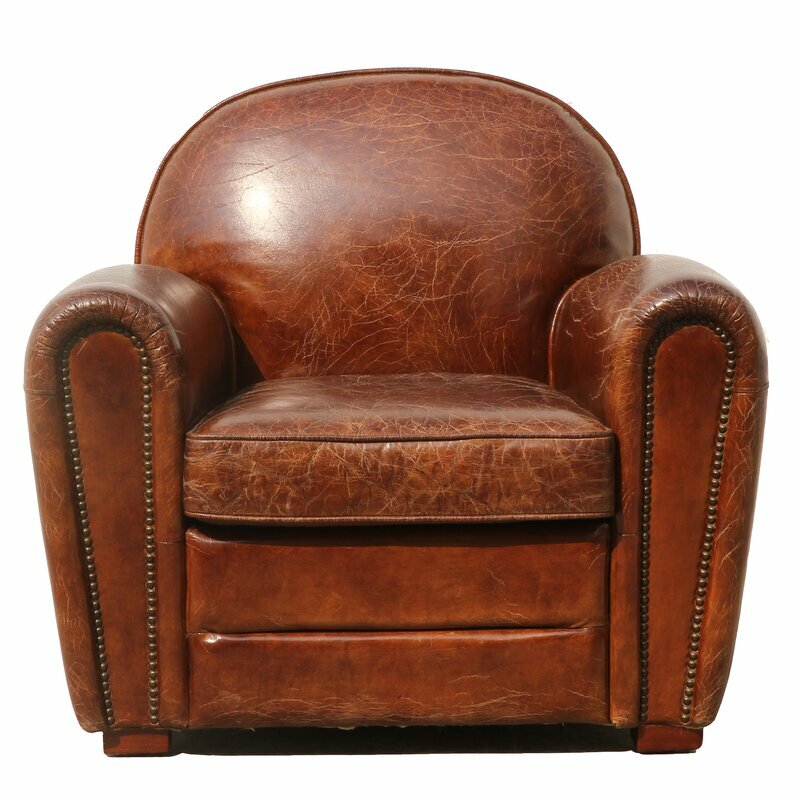 Paris Leather Arm Chair: FIND HERE. 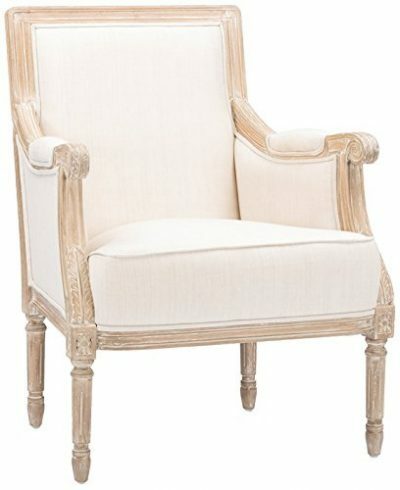 French inspired Arm Chair: FIND HERE. 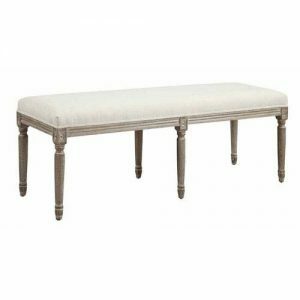 Louis Style Bench: FIND HERE. 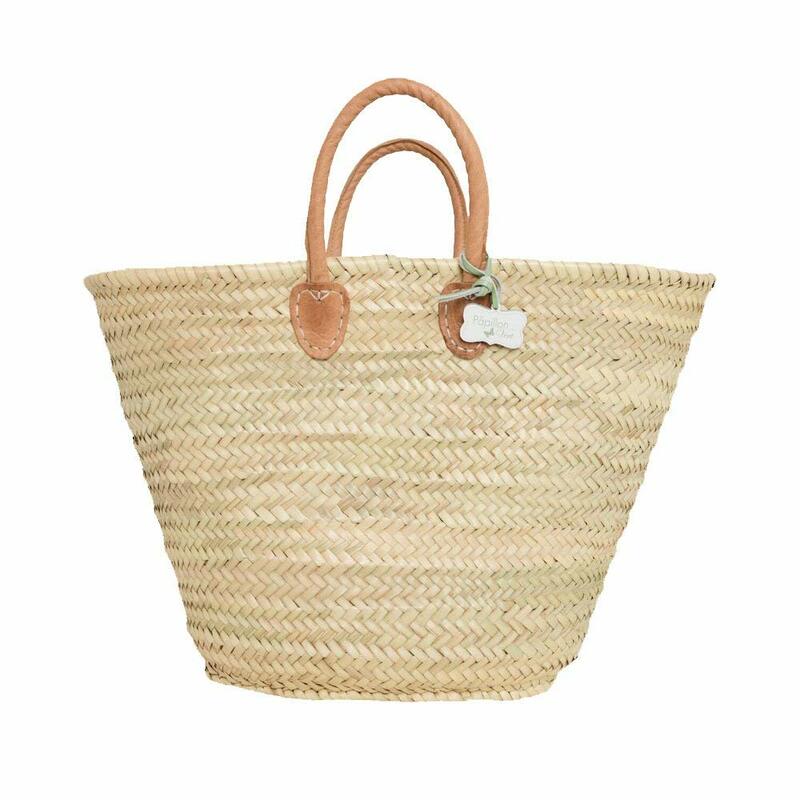 Frenchy Market Basket: FIND HERE. Does Santa need to bring me you this? 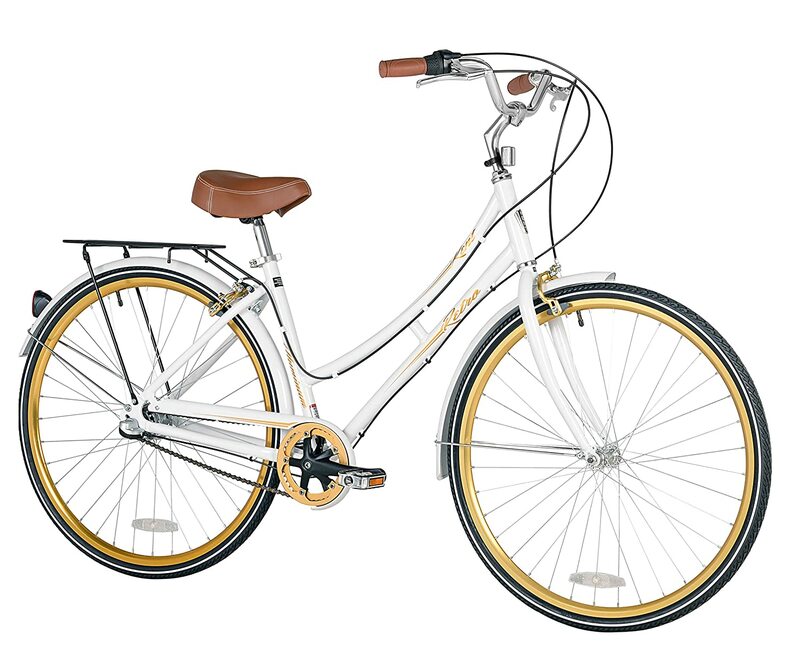 In case a romantic retro style bike is in your future. White Bicycle: FIND HERE. 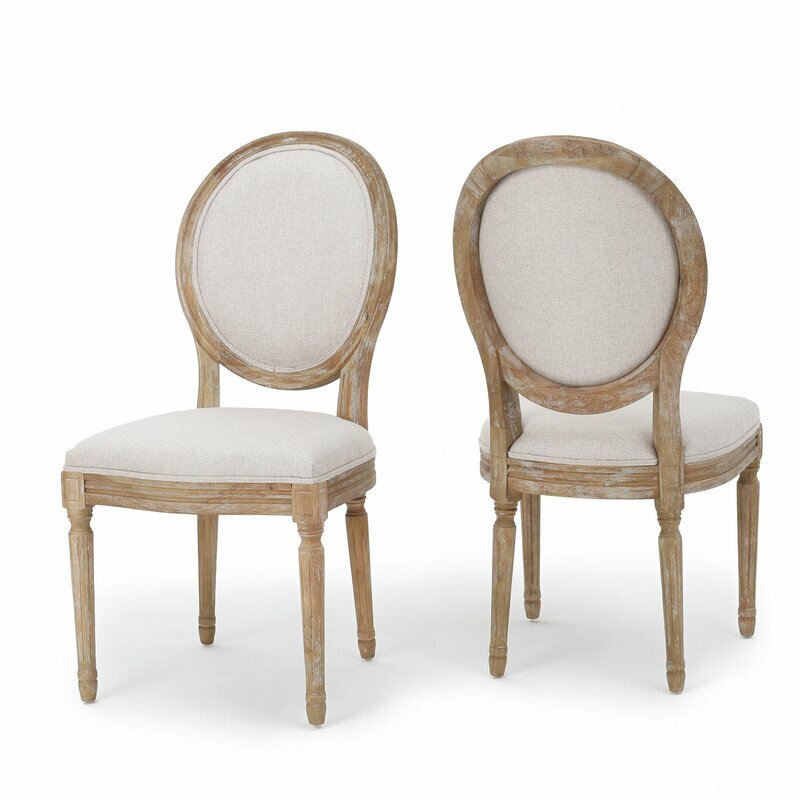 In case an elegant linen chair needs to come live with you. 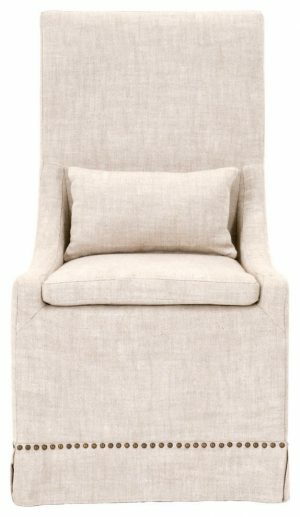 Slipcovered Linen Side Chair: FIND HERE. 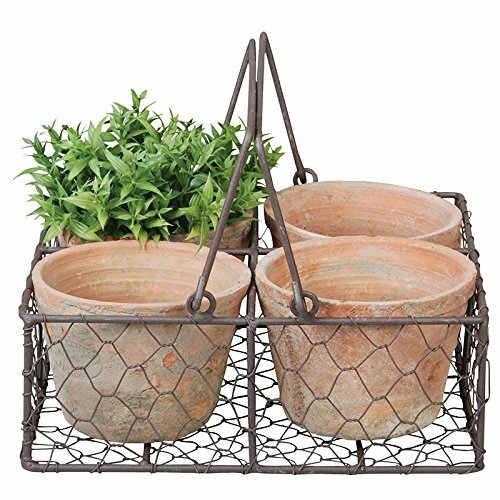 Aged Terracotta Flowerpots in Basket: FIND HERE. 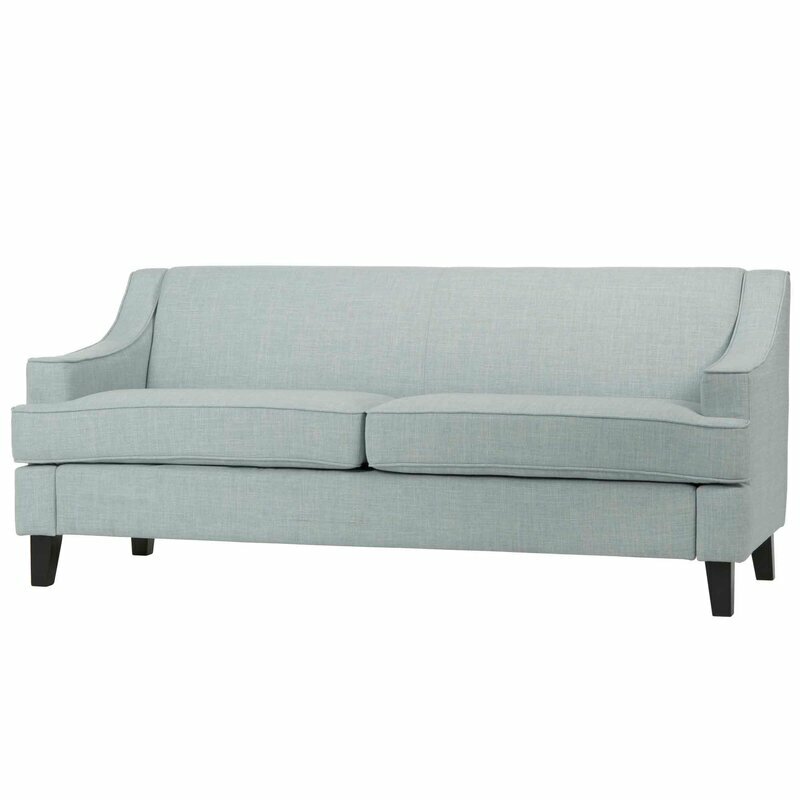 Mosey over to OKL for even more decorating ideas for Parisian style. Is anyone easing into the spirit of Thanksgiving, advent, and holiday magic? We have a beautiful blanket of snow and chilling temperatures so it certainly feels like the holidays to me…see this CELEBRATION OF PLAID FOR THE HOLIDAYS for inspiration. Are you pinning fall and holiday decor ideas yet? PLEASE VISIT my fall board and HOLIDAY BOARDS and save away! 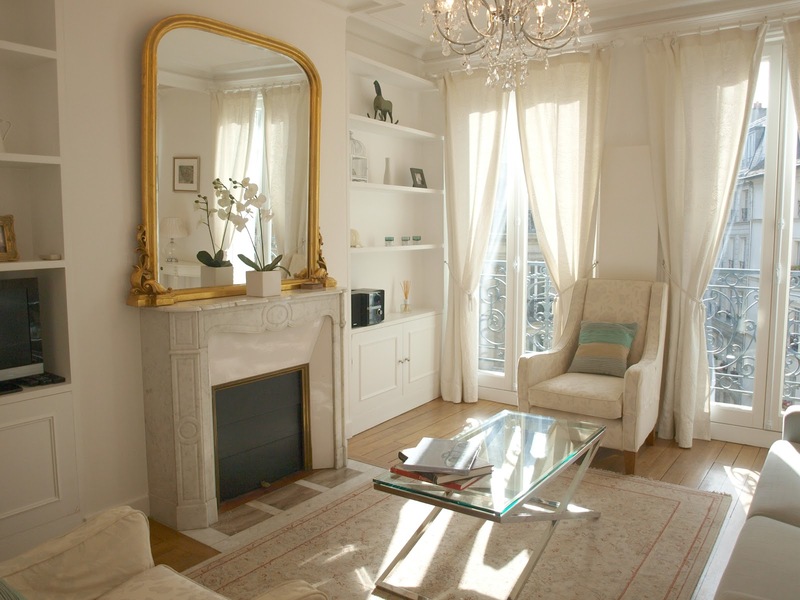 Thanks for the virtual look at the beautiful Parisian apartment! What a lovely post for the weekend. Thanks for taking a peek, friend. Enjoy the weekend – and peace right where you are.